What to talk about the smartphone. Smartphone has some deep bonding in our human life like it’s our best friend in life. Seriously, even when we go to sleep we took our smartphone with us and in the next morning, the first thing we do with our smartphone is to stop the alarm, quickly check our social media feed and then rush back to the office. In this world, who don’t know about android? It’s the leading operating system in the smartphone industry. Late but at last Nokia comes back with a budget-friendly Nokia new mobile and named it Nokia 5. Nokia smartphone 2017 has a variety of options for the customers to pick the right device for them. Nokia 5 was launched in February 2017. For a budget-friendly phone, Nokia 5 looks and feels premium in hand. But for most of the people, what’s inside of a smartphone counts more than how it looks. Find out whether this budget-friendly Nokia5 is right choice to buy in the full review! Nokia 5 has premium quality metal build with a fingerprint scanner with it. Nokia 5 sits in little awkwardly in between the best equipped Nokia 6 and the cheap tag Nokia 3. Nokia 5 entirely made from metal and has rounded corners for a very ergonomic feel. The speakers are located on the bottom and they are pretty loud also. Additionally, this phone is IP52 drip resistant certified, which means you would not able to take it for swimming. It’s more about a budget smartphone. With a 5.2 inch 720p HD display, Qualcomm Snapdragon 430 processor along with 2 GB of ram powered by Android 7.1.1. Watching media is acceptable but not the best experience for gaming or watching YouTube. If you use your smartphone for primary media consumption then it might not the device you are looking into. Nokia 5 has an octa-core Qualcomm Snapdragon 430 processor powered by 1.4 GHz speed with an Adreno 505 GPU. It’s all perfectly serviceable; it’s just not the most pleasant experience you will get. Having only 2 GB of ram this is the phone that most of the budget-friendly phone has but Nokia 5 is not your phone is you are a heavy media user or use multitasking for most of the time. Nokia 5 has 16 GB ROM which is expandable up to 128 GB. It also has 13 mp rear and 8mp selfie camera. Nokia 5 is more of a budget-friendly smartphone with a reliable brand name. 3000 mAh battery will run through a whole working day otherwise if you are not a die-hard gamer. Nokia 5 Price in Bangladesh | Where to buy Nokia 5? Ajkerdeal.com only sells the authentic phone distributed widely by Nokia Bangladesh. Our entire product ensures its highest quality. As leading in online shopping industry in Bangladesh ajkerdeal also offers you best mobile phones. Just order and you are done; the product is on its way to your home. 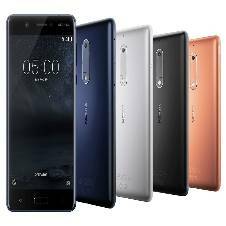 Check out Nokia 5 price in Bangladesh aj AjkerDeal.com and grab your desired smartphone at the best price in the market. You will always get 100% authentic product as we always maintain our quality. Get EMI offer on any mobile phone which is over 5000 tk. for 6 months easy installment option without any interest. We always provide you the best for your money. Grab your Nokia smartphone at the best price in Bangladesh at AjkerDeal.com with guaranteed lowest price in the market and the best product. Place an order online and get your phone delivered to your home. Enjoy a great shopping experience at AjkerDeal.com! We have a prosperous collection of most popular Nokia mobile phones. Browse Nokia mobile phone category at ajkerdeal.com for finding your desired Nokia phones. You can also check out Nokia 6 price in Bangladesh to get the best price at AjkerDeal.com! We have a wide variety of smartphone for all of our customers with budget filtering option. Just put your budget and ajkerdeal will do the hard job finding the right product for you. Its never been this much easy before. Ajkerdeal.com ensures the best price on the market so you don’t have to look elsewhere for buying your product. We believe in customer satisfaction, so we will do everything to make you comfortable shopping with us. You can also look for various good brands of a smartphone such as Xiaomi, Symphony, Walton, Lenovo, HTC, Oppo, Sony, iPhone, Huawei, Maximus, Lava and many more. Happy Shopping!! !